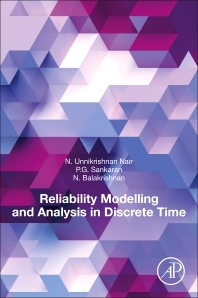 Reliability Modelling and Analysis in Discrete Time provides an overview of the probabilistic and statistical aspects connected with discrete reliability systems. This engaging book discusses their distributional properties and dependence structures before exploring various orderings associated between different reliability structures. Though clear explanations, multiple examples, and exhaustive coverage of the basic and advanced topics of research in this area, the work gives the reader a thorough understanding of the theory and concepts associated with discrete models and reliability structures. A comprehensive bibliography assists readers who are interested in further research and understanding. Requiring only an introductory understanding of statistics, this book offers valuable insight and coverage for students and researchers in Probability and Statistics, Electrical Engineering, and Reliability/Quality Engineering. The book also includes a comprehensive bibliography to assist readers seeking to delve deeper. N. Unnikrishnan Nair obtained his Ph.D. from the University of Kerala, India and was conferred the degree of Doctor of Human Letters (honoris causa) by the Juniata College, USA. He was Professor and Chair, Department of Statistics, Dean, Faculty of Science and the Vice-Chancellor of the Cochin University of Science and Technology in India. He is a Fellow and past President of the Indian Society for Probability and Statistics, as well as an elected member of the International Statistical Institute. Dr. Nair has published 150 peer reviewed research papers and is an author, editor, or contributor of several books for publishers including Birkhauser, Boston and Education Book Distributors (and others in foreign languages). P.G. Sankaran received his Ph.D. from Cochin University of Science and Technology (CUSAT), India. He was Professor and Chair of Department of Statistics,CUSAT . Presently, he is the Pro Vice Chancellor of CUSAT. He was awarded BOYSCAST Fellowship of the Department of Science and Technology, Government of India in 2000. He is a member of the International Statistical Institute and was the Executive Council of International Society for Business and Industrial Statistics. His commendations include the Young Researcher Award of International Indian Statistical Association (IISA) in 2010, and his output encompasses 130 research papers and three books published by Springer, Birkauser, Education Book Distributors and the Department of Statistics at Cochin. Professor Narayanaswamy Balakrishnan is a Distinguished University Professor at McMaster University Hamilton, Ontario, Canada. He has been a visiting professor in many universities across the world. Balakrishnan is a renowned expert on statistical distributions and his four-volume reference series on this topic, co-authored with Professors Norman Johnson and Samuel Kotz, continue to serve as an extensive guide for researchers working on statistical distribution theory. He is currently the Editor-in-Chief of Communications in Statistics, and is an editorial board member for a number of journals. He is a Fellow of the American Statistical Association and the Institute of Mathematical Statistics, and he received an Honorary Doctorate Degree from the National University of Athens, Greece.